Florelle centerpieces can also be used for corporate events, sweet 16s, collegiate events, baby showers, bridal showers, and any other event you can think of! 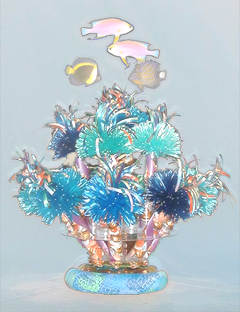 We even offer centerpieces for communions, baptisms, and other important religious milestones. 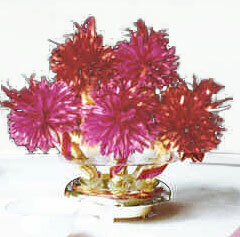 You can customize your bouquet for any type of party or event. Create a unique centerpiece with our Themed Favor centerpieces. Mardi Gras, tropical, political, and ocean-themes, are just some of the dozens of themes you can customize to fit your event! Florelle makes it easy and fun to create centerpieces that are designed to complement your favorite theme for any celebration, including parties, showers, and weddings. Themes can also follow the seasons. We will make sure your celebration is in harmony with the natural shades of spring, summer, winter, or fall. All of our floral-inspired designs look incredible in both outdoor and indoor areas. Whether you need princess-themed centerpieces for sweet sixteen or ocean-inspired centerpieces for your wedding day, we can create a stunning bouquet that will bring your special event to life. We have an endless array of colors in stock to match the colors you need. For corporate events or alumni reunions, we can match your company colors, your school's colors, or any other colors you want! How about baby blue or baby pink 1st birthday centerpieces for your child’s first birthday celebration? We carry every color imaginable, including white, cream, and soft pastels to bold purple, scarlet, and other bright hues. 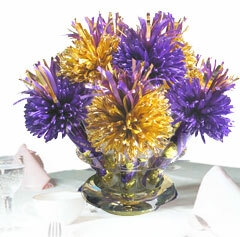 Whether you're planning a romantic Valentine's Day ball, a baby or bridal shower, or an outrageous Christmas party, our party favor centerpieces will create the perfect tone and mood for your event. From adorable baby shower centerpieces to birthday party centerpieces, each favor centerpiece instantly creates a festive atmosphere while providing a hand-crafted favor for all your guests to take home. These are just some of the hundreds of styles and colors we can provide you with. Our helpful designers are standing by to help you design a unique centerpiece that's right for you to make your event elegant and unforgettable, so call us now.